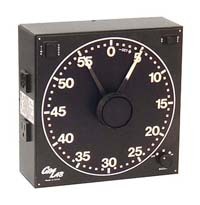 The GraLab Model 300 is the classic general purpose darkroom timer, a staple in darkrooms for decades. Over the years, there have been a number of changes to it. One of the most dramatic was when GraLab switched from metal case and hands to plastic, and made the timer slightly smaller. Many people still prefer the older timer with metal case and larger dial. These timers are the late version of the metal case GraLab 300, with grounded outlets, volume control, and rocker or toggle switches for the On/Off and Time/Focus controls.